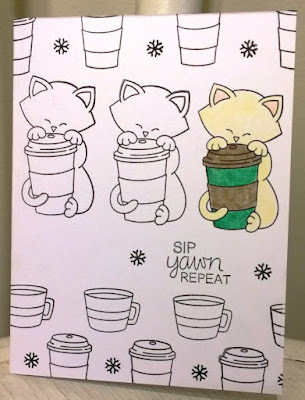 Repetitive stamping using Newton Loves Coffee stamp set. I colored one image of Newton to make him stand out using prismacolor pencils. This card is number 656 in the hop. So cool. I like how you spotlighted one of the Newton images. The sentiment works great too! I like how you repeated the image to go along with the "repeat" sentiment. Super fun, love the uncolored images in contrast to the one you colored. Love this! Great idea to leave all but one uncolored! Pretty card!